The resulting (gluten-free!) recipes show that baking with alternate flours adds an extra dimension of flavour. Brownies made with rice flour taste even more chocolaty. Buckwheat adds complexity to a date and nut cake. Ricotta cheesecake gets bonus flavour from a chestnut flour crust; teff is used to make a chocolate layer cake that can replace any birthday cake with equally pleasing results. All of the nearly 125 recipes—including Double Oatmeal Cookies, Buckwheat Gingerbread, Chocolate Chestnut Soufflé Cake, and Blueberry Corn Flour Cobbler—take the flavours of our favourite desserts to the next level. 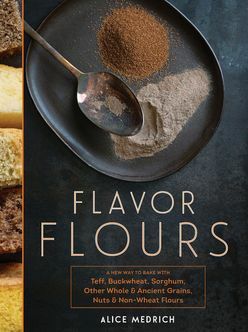 In this monumental new work, beloved dessert queen Alice Medrich applies her baking precision and impeccable palate to flavour flours—wheat-flour alternatives including rice flour, oat flour, corn flour, sorghum flour, teff, and more.